Uber gaming blogger Kotaku got some interesting flak for the Entertainment Software Association (ESA), the organization that gives ratings to video games. 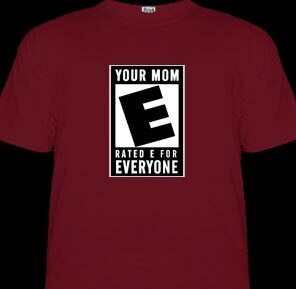 Kotaku had a posting about a guy selling t-shirts that said: “Your Mom – Rated “E” for Everyone”. The phrase “Rated E for Everyone” is what the ESA uses for its rating / tagline regarding “kids games” like Cars or SpongeBob Squarepants. The ESA is posturing that the post is an advertisement, and that the posting will create consumer confusion, and “a substantial likelihood that the ESRB certification marks will face tarnishment and dilution.” that has commercial purposes and tarnishes their mark. I agree with the IP Rights and Games Special Interest Group: The t-shirt itself is probably not really a parody; it’s just going for a ride on the good will built by the ESA. But the blog reporting about it? That’s editorial comment, fair use in its purest form. “E” is for execrable, too, ESA. And excess. (And ethically questionable.) Give it up.